364 pages with frontispiece, diagrams and index. Octavo (8 1/2" x 5 3/4") issued in red cloth with gilt lettering to spine. Translation from the German Die Praxis meines Systems, Berlin, 1929 by J Du Mont. Introduction by W H Watts. (Betts: 29-101) First British edition. Fully annotated games played by the author, illustrating the theories discussed in My System and arranged under the headings: Centralization (games 1-23). Restriction & blockade (24-52). Over-protection (53-60). The isolated queen's pawn (61-70). Alternating maneuvers against enemy weaknesses (71-77). Excursions through old and new territory of hypermodern chess (78-109). 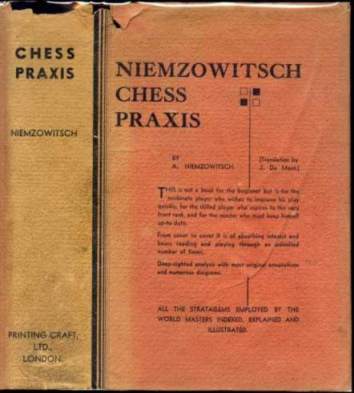 Includes indexes to games, stratagems and openings. Corners bumped, spine gilt dulled, head page ends soiled. Jacket spine sunned, spine ends and edges chipped. A very good in a good to very good dust jacket.